Most of the “experts” have spouted this piece of advice over the years when anyone brings up the subject of life insurance. By “experts” we mean everyone from financial “gurus” like Dave Ramsey and Suze Orman, to your in-laws, your barber, your preacher and your kid’s kindergarten teacher. We think it’s utter nonsense. Professor Babbel is co-author of “Buy Term and Invest the Difference Revisited,” published in the May 2015 issue of the Journal of Financial Services Professionals. Although much lip service has been given to the notion of “buy term and invest the difference,” we’ve never met anyone who actually bought a term policy, priced the cost of a permanent policy with an equivalent death benefit, and then put the difference into an investment account every month. 1. Do you have any equity in the policy? The dividend-paying whole life insurance policies used for this concept have a cash value which is guaranteed to increase every year. A portion of your premium goes into riders that enable you to have significantly more equity in your plan, especially in the early years of the policy. It also reduces the commission the agent receives by up to 70%. Buying a term life policy is like renting insurance, and studies show that you’re likely to have zip to show for it, as most term policies never pay out a claim. Term policies are designed to terminate before you do, as many experts point out (even those who recommend term insurance). Case in point: Suze Orman writes “these policies are not very expensive… because the insurance company knows you have relatively little chance of dying while the policy is in force.” (Source: The Road To Wealth, 2001). 2. Does it give you protection against inflation? The death benefit can increase over time, as dividends left in the policy are used to purchase additional coverage. Here’s an example of how this type of policy can protect you against inflation. Most term policies recommended by the financial gurus have a level death benefit for the term of the policy. If you buy a $250,000 20-year term policy, and inflation averages 4% per year, your policy will lose 56% of its value! 3. Are you protected if your health deteriorates? You’re insured until the policy matures (typically age 121), as long as you don’t let the policy lapse. Changes in your health have no impact on your coverage or premium. If your health deteriorates during the term of the policy and you bought the kind of policy recommended by experts like Dave Ramsey and Suze Orman, you’ll have to pay more to renew it, or you might not qualify for coverage at any price. 4. Can you predict how much your plan will be worth when you’re ready to retire? You can know the minimum guaranteed value of your policy in any given year, as well as the minimum income you could take from the plan and for how long you could take it. 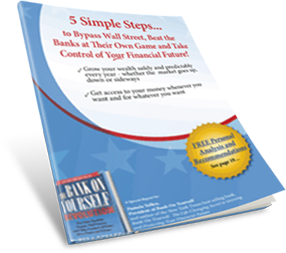 To find out what your numbers could be, request a free Bank On Yourself Analysis here. If you “invest the difference” in stocks and mutual funds, you have no way of knowing how much money you’ll have when you need it, because there is no way to know the value of your investments next year OR in 30 years. Furthermore, if you are investing inside your retirement plan, you are subject to strict 401k withdrawal rules.